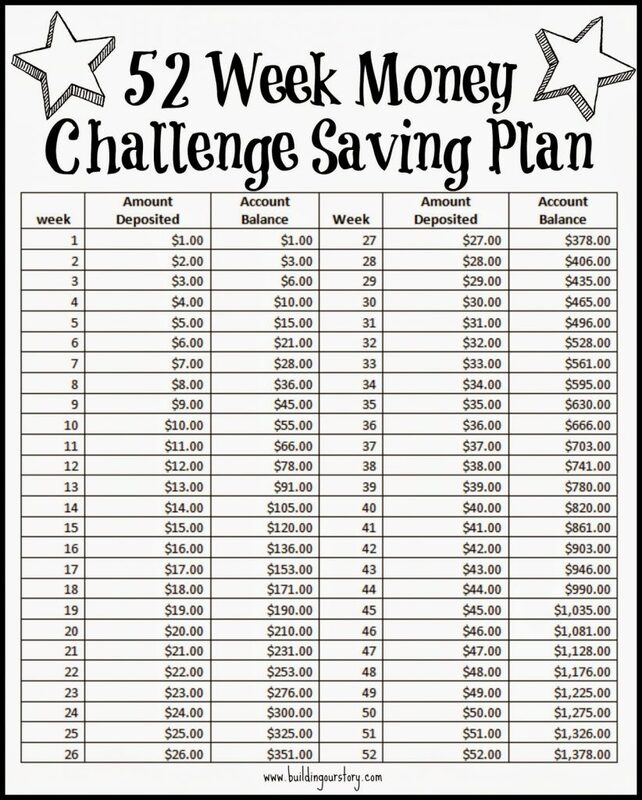 Last year I was introduced to the 52 Week Money Challenge and I was determined to do it – times 2! Well I am hear to update you all. We tried and while we didn’t keep up with the 2 jars we did complete one jar for the 52 weeks plus a little extra. This year we will continue this and try for a full 52 weeks again. It is so nice having this extra cash at the end of the year, especially for Christmas gifts! Perfect!! Maybe this is your first time hearing about the 52 Week Money Challenge Saving Plan. So here are the details. This is literally the easiest way to save almost $1,400 in a year! Every week you deposit money into your jar or bank account, however you decide to do it. The amount depends on the number of week it is in the year. Print out this free printable and keep track of your weeks. Maybe on a “blessed” week do a couple weeks if possible. This year we will be using this printable and will again use cash and our jar. Instead of going week by week, every Sunday I will deposit some money into the jar. This will depend on how our finances are going – maybe on a tight week I will put in a small dollar amount but on a good week strive for those large numbers towards the last weeks on my print out. I may actually go in reverse order so that the large amounts occur when I get my tax refund (well it all depends on how the 2017 tax reform bill effects my taxes this year).Honestly, there is no RIGHT way to do this but if you fill a jar with this amount of money you will end up with close to $1,400 dollars by 2016!! Boom!! Make this a goal this year! Good luck!! Have you done this 52 Week Money Challenge Savings Plan before? Are you planning to do it this year as well? We have done this for the past two years, and I love it!!! It is just so easy, I set my alarm on my iphone to go off every Sunday at 5:00, and we put our money in. It so much easier than a christmas club. What a great idea! I love the idea of having over $1000 saved by this time next year, and the printable makes it easy to stay on track.